There are 40 million people in the world today who live without a voice. They lose the ability to speak because of various conditions: cerebral palsy, autism, mental retardation, strokes, motor neuron disease, and many others. Most non-verbal people are intelligent, aware and sensitive. But because communication is the bedrock of social interaction, their ability to integrate into mainstream society remains limited. All over the world, there has been a concerted effort to develop and use Assistive Technologies to help non-verbal people communicate. 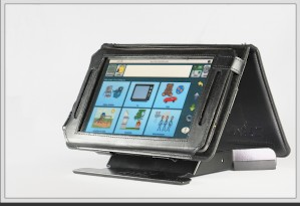 These tools are called Augmentative and Alternative Communication (AAC) devices. In most developed countries, such tools have become a part of life for non-verbal people. But not in India. We developed Avaz between 2007 and 2010, working closely with the folks at Vidya Sagar and other special needs schools in the country. As our thoughts began taking shape, we decided that we did not want to just create a technological device – we wanted to create an artificial voice. And so, when we designed Avaz, we wanted to give it all of the features that we (who are verbal) take for granted. Avaz was designed and commercialized by Invention Labs, a start-up based out of the IIT Madras Research Park in Chennai and started by alumni of IIT Madras. The Avaz story began in 2008 as a joint project of Invention Labs, IIT Madras and Vidya Sagar, Chennai. Both Avaz and Invention Labs have won a number of awards and recognitions since our inception.